The 2013-2015 California drought has brought much public attention to the amount of water used in agriculture, and particularly which crops use the most water. Although almonds have taken the hit lately, alfalfa is often one of the favorite whipping boys of agricultural critics due to its high water use on a state-wide basis. But is alfalfa's water profile really so miserable? Contrary to popular belief, alfalfa has several unique positive biological properties and advantages when it comes to water. 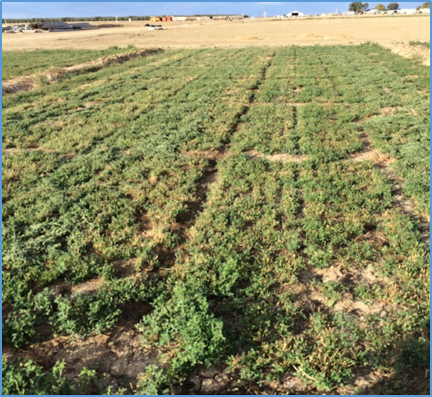 Due to these properties, alfalfa is remarkably resilient when it comes to severe drought conditions. 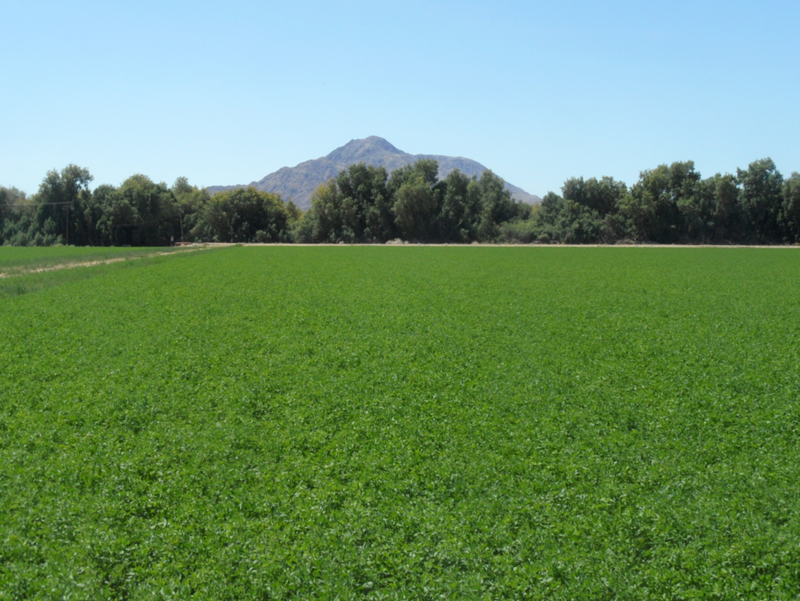 Alfalfa can grow year-round, and yield over 14 tons/acre of high quality forage, the basis for milk production-such as this drip irrigated field in Imperial Valley, CA. An average CA alfalfa field can produce a potential milk yield of 2400 gallons/a/year. Due to high yields and the fact that 100% of the above-ground plant material is harvested, water use efficiencies are high (photo, D.Putnam). First a clarification—Alfalfa does not really use more water than other crops. At full canopy (when the leaves cover the soil surface), alfalfa's water use is not much different than any other crop (think spinach, lettuce, tomato, wheat, almonds or corn) per unit time. The Evapotranspiration (ET) requirement (the amount of water a crop really needs to grow) is remarkably similar across crops at full canopy (see FAO tabulated values for the water requirements of crops). Alfalfa's water use profile in California is primarily due to its high acreage and nearly year-round growth pattern in many regions. If spinach were continually grown on 850,000 to 1 million acres all year long, the water use would be about the same as alfalfa, perhaps more. Further, it's not so much how much water is used, but how much crop is produced per unit water that is important – also known as water-use efficiency. In that category, alfalfa shines. Contrary to popular belief, alfalfa has several unique valuable properties and advantages which would enable cropping systems greater resiliency under drought conditions. Deep-Rootedness—alfalfa roots are commonly 3-5 feet deep and can extend to 8-15 feet in some soils. Therefore this crop can utilize moisture residing deep in the profile when surface waters become scarce. It shares this property with crops such as orchards, vineyards, and sugarbeets and safflower, unlike crops such as onion, lettuce and corn, where it's easy to lose water past the root zone. Alfalfa's deep roots are capable of extracting water from deep in the soil, thus much of the water applied is not wasted. Additionally, deep roots enable the crop to survive periodic droughts (Univ. of Minnsota illustr.). Perenniality—The fact that the crop grows for 4-8 years, grows quickly with warm conditions in the spring is a major advantage of alfalfa—it can utilize residual winter rainfall before irrigation is necessary. This is unlike summer-grown annual crops that need to be replanted each year (water use efficacy is low during this time). In many areas, the first cutting of alfalfa of the year requires zero irrigation– supported only by rain and residual soil moisture. Very High Yields—Alfalfa is a very high yielding crop, and can grow 365 days a year in warm regions (such as the Imperial Valley of California and southern Arizona). Its biomass yields are very high—we can get up to 12 cuttings per year in those regions, and growers with top management can obtain more than 14 tons/acre dry matter yields. High-yields create higher water use efficiencies. High Harvest Index, High Water Use Efficiency—Alfalfa's Water Use Efficiency is not only due to high yields, but because nearly 100% of the above-ground plant material is harvested (known as the harvest index). In most seed-producing and fruiting crops, only a portion of the plant is harvested (typically 30-50% of the total plant biomass). Salt Tolerance/Ability to Utilize Degraded Water—Recent data has shown that alfalfa has a high degree of salt tolerance. A recent trial in Fresno County, where EC 5.5 water was used for irrigation over 3 years, yields were normal (10-12 tons/acre). This is important in a drought, since degraded recycled water (municipal waste water, drain water, other waste water) could be used on this crop, while saline waters would injure less-tolerant crops. Contribution to Wildlife Habitat—In a drought, all of nature suffers. Alfalfa has been shown to be a significant wildlife habitat due to its lush foliage and insect diversity. Biologists have determined that 28% of California's wildlife use alfalfa for nesting, feeding, or cover. 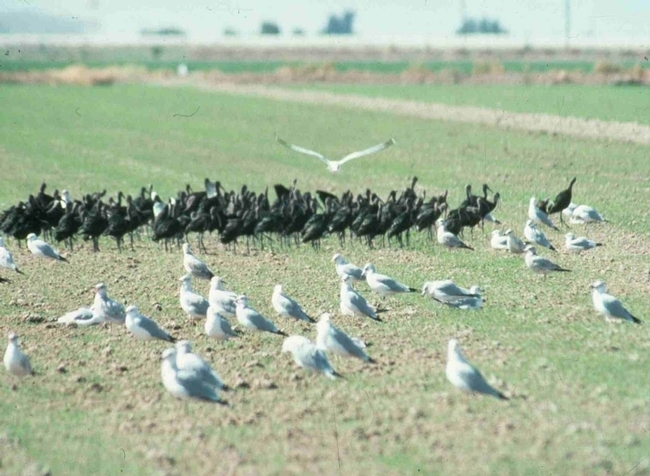 Even partial-season irrigation during drought can assist wildlife in survive a drought period by using alfalfa as habitat. Don't believe it? Visit an alfalfa field and observe the egrets, curlew, hawks, eagles, snakes, deer, antelope, elk, insects, and many birds and mammals who are at home there. Ability to Survive a Drought—Alfalfa evolved in regions of the world with long hot dry summers and wet winters – exactly like California. Although yields are highest with full irrigation, alfalfa can survive periodic droughts. This is due both to deep roots as well as ability to go ‘summer dormant' under dry conditions. 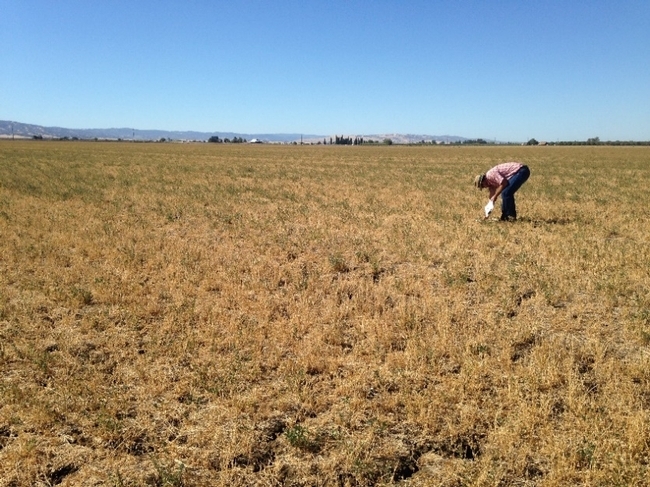 In 2014, Central Valley growers that were forced to stop watering their alfalfa fields generally found the crop recovered after rainfall or irrigation resumed later in the year. Ability to Deficit irrigate: Obtain Partial yields—Typically 50-60% of full yields are obtained by mid to late June (Figure 1). If only partial water is available, irrigation water can be applied early (supplemented by winter rains and residual moisture), and the crop dried down during late summer periods. This is particularly important, since water is scarcer in late summer vs. early, and that water may be used for other crops or uses, or economically transferred to cities. Additionally, Water Use Efficiencies are greatest early in the year, and yield and quality tend to be higher early vs. late. Yield Patterns from University of California variety trials over a 10 year period in an Intermountain site (3-4 cuts/year), and the San Joaquin Valley (8-9 cuts/year). Over 50% of full yield is frequently obtained by mid-June, creating partial harvests in the event water is needed to be transferred for other uses later in the year. It is this combination of deep roots, ability to utilize rainfall early in the year, high water use efficiency, ability to survive droughts, salinity tolerance, and ability to give partial yields with as much as half of the irrigation water that makes alfalfa particularly valuable in a drought. University of California work done over the past 20 years has confirmed the ability for growers to stop alfalfa irrigation in mid-summer, allow the crop to dry down, and re-water successfully later when irrigation water becomes available. One cannot do this with many other crop species. Summer-grown annual crops (corn, cotton, tomato, sunflower) also have a high degree of flexibility --in the sense that one could elect not to grow those crops during a drought, thereby reducing water used for these crops to zero. But yields are also reduced to zero. High value vegetable growers are unlikely to sacrifice any water since the economic value of those crops is so important to their farms. Additionally, one cannot really deficit irrigate spinach, broccoli, onions, lettuce or strawberries too much and expect an economic product. Winter grown annuals (wheat, oilseeds) and safflower also have major advantages during drought, since they can be grown with very little irrigation water, and can be eliminated during low water years. Orchards have the least flexibility in a drought, due both to the significant yield reductions when less-than-full irrigations are applied, but also the significant economic risk to the farm because of the high investment cost. Contrary to some popular views, alfalfa has a range of positive biological characteristics that should be quite useful when facing water-short conditions. These characteristics include a high degree of flexibility to ‘deficit irrigate' the crop, ability to survive drought periods, high water-use efficiency, deep rootedness, salinity tolerance, and the ability to utilize degraded water. It is additionally very valuable to wildlife, which also suffers during a drought. Oh, and by the way, it is also very valuable to the millions of consumers who depend upon the milk, cheese, yogurt, and yes ice cream, produced from alfalfa. 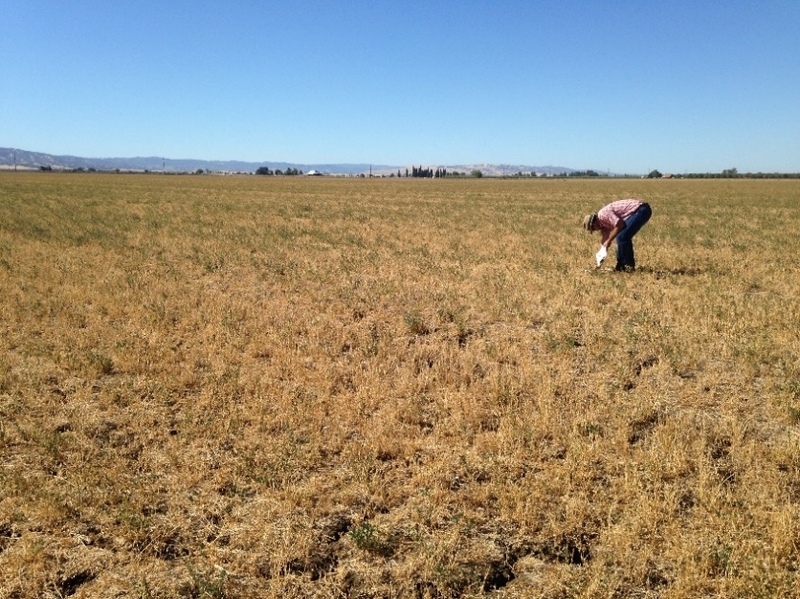 This Yolo County Alfalfa Field was dried down in 2014 due to the drought, looking quite dead. However, most of the crop recovered after re-watering late in the year. Although resiliency can be improved by breeding and management, alfalfa has the ability to sustain crop production during drought periods (Rachael Long, photo). This alfalfa variety trial was irrigated with saline (EC5.5) water during 2010-2012, and then received zero irrigation water during 2013 and 2014. However, the crop nearly fully recovered after re-watering in the fall of 2014. The resiliency of the crop may be attributed to its deep rooting patterns and saline tolerance (Western Fresno County, October, 2014, D. Putnam, photo). Thank you for a much-needed, biological and agronomic perspective on alfalfa's use of water. You make a strong case that alfalfa is unfairly maligned. If California would move toward a true, market-based system for water sourcing and distribution, much of the criticism would be muted. Water would be used in a more economically efficient way, which likely would favor crop production. Very interesting article. What I wonder is if you perhaps should consider the rest of the livestock business when comparing product efficiency. Unlike, say, almonds or lettuce, hay isn't consumed directly. Cattle uses a lot more water than just the hay, so perhaps milk, cheese, or meat should the correct products to compare against. Of course, as far as farmers are concerned, they just deliver a crop and your data makes a lot of sense. Good points. There are definitely inefficiencies (with all crops) by the time it gets to the table. This issue of final product efficiency is interesting but is tricky business - what do you consider to be the important measurement? - pounds of product per unit water? Nutritional or monetary value (to whom-the farmer or consumer?) Calories per unit water? (In that case, suagarbeet would be the hands-down winner, and we should all eat plenty of sugar?) Protein per unit water? Staple foods like milk, wheat or rice, vs. specialty (luxury?) foods like almonds and wine?? Lettuce, though consumed directly is great stuff, love it! But nutritional value compared with milk? Kale, maybe. Since consumers demand a wide range of foods, those are what growers grow, responding to markets. If we applied a water-use efficiency metric, we probably wouldn't grow lettuce - depending upon how you calculated it! One key point of that exercise is that innately food production require lots of water - something we should all be aware of. By the way, the economic value to CA of the livestock-forage system (as a %) is approximately equal to its water footprint. AS usual a very good article that has application here in Central Texas. Appreciated the insights in your article, found it via a summary in an electronic magazine. Very applicable in Texas. Agree totally. My only concern is too much water/rain on heavy soils. We received 32 inches since planting in October. Lost about 100 % stand in low spots; 65% of 24 acres. Need to drain better but land is too flat. I'm working with UofG Agronomist in testing/selecting cultivars that can withstand excess rainfall. Alfalfa seedlings especially are subject to flooding - both pythium and phytopthora root rots and other diseases, and just plain lack of oxygen. One of the reasons alfalfa isn't widely grown in the South. We've had periodic losses of alfalfa in the Sacramento Valley in the past- back when we actually had rain. In some areas, you could consider re-planting, which some of our growers have done after a stand loss. We're jealous about your rainfall! Good information for farmer and urban dweller alike. Two points -with the subsidence and overdraft in California it is important to note that continued mining of groundwater is not in agriculture's long-term interest and that fields irrigated with mined groundwater should be fallowed. And, the picture of an alfalfa field irrigated with low-volume emitters is lovely but might be misleading. What percentage of CA alfalfa fields are flood and sprinkler irrigated? Thanks. Many thanks for your comments. CA Alfalfa fields are likely at least 82% surface systems (check flood, bedded), sprinklers 15% (pivots, moveable pipe and wheel lines) and buried drip a few percentages - but increasing. Groundwater recharge is an important benefit of surface systems - we are working hard on subsurface drip and sprinkler systems which have advantages in matching water with crop need - however, both groundwater recharge and wildlife habitat are improved with surface systems. Salt management too. Surface systems have the advantage of very low energy requirements, but have important limitations which are well understood. We recommend a more flexible approach which uses all systems when appropriate. One shouldn't have a 'knee jerk' view that is: 'why doesn't everyone use one system (e.g. drip)" Each system has its appropriate uses. Groundwater pressures are immense and we need to understand them better. However, some are easily refilled, but others not. No matter which system is used (surface, sprinklers or drip) we need to learn how to manage them better, and how to respond to low water years. Each is subject to improvement. Really a mind changing article' removing misconception that alfalfa is a crop for areas with abundant agricultural water. To Cater with drought like situation in Pakistan' sorghum may be the best choice among summer forages while alfalfa has the potential to provide nutritious forage in May-June when there is a severe deficiency of forage for ruminants. after reading the biological characters of alfalfa' I must say Sorghum and alfalfa are panacea for undernourished ruminants in Pakistan. Thanks for your comments, Aamir. Actually, it's interesting that in regions of the world with lots of rainfall, there is not much alfalfa, as in tropical areas. Very interesting article regarding biological and agronomic prospective on alfalfa’s use of water. We have drought condition in our area in Punjab (Pakistan) and cannot irrigate the alfalfa field for last two months. But only I inch of rainfall after two month the alfalfa crop regrowth very well. Hopefully from next month rainy season starts and take advantage of higher yield from alfalfa crop. Very good article, which was informative and timely. But I question the yield numbers cited: (10-12 tons/acre) normal and up to 14 tons/acre. An earlier report "Alfalfa Production Systems in California" by D. Putnam, C. summers and S. Orloff 12/2007 cited average yields of 7.0 to 7.5 tons/acre. Our local statistics are similar. Perhaps I am missing a conversion factor? The 'normal' yields I quoted were specifically for that variety trial in Fresno County under high salinity, which were in the 10-12 t/a range (e.g. normal for our variety trials in this area which tend to be higher than county averages). It is true that yields can reach 14 (or even 16) t/a in the San Joaquin Valley and Imperial Valley- and we have seen this on grower's fields, especially with drip. But you are quite right the AVERAGE yields for this region are closer to 8 tons/acre. Statewide in CA, average yields are actually closer to 7-7.5 tons/acre due to lower production in the Intermountain regions (3-4 cut, short-season area). Actual yields on growers fields in depleted stands under lower management, can be near 4-5 tons, but approach 14 tons/acre under top management in long seasoned environments. Within a region, yields can vary widely due to management and age of stand. So you are correct to challenge this, but what I quoted was accurate. Thanks for the comments! Many years ago Tom Lockhart told me that alfalfa will use readily-available nitrogen in irrigation water preferentially over fixing it from the atmosphere. Do you know if that is the case? I know alfalfa is commonly used in reclamation projects for nutrient management, but a common criticism of that crop choice is the well-known fact that legumes help to nitrogenate the soil. People ask me why are you nitrogenating the soil in a nutrient management plan supposedly designed to consume waste nitrogen? Yes, alfalfa will take up excess N in irrigation water (or manure or municipal wastewater). It's also true that legumes produce nearly all of their own N for their growth, especially alfalfa and they provide N to subsequent crops. So both are true. However, with alfalfa, and with many legumes, when excess N is available in the soil solution, it will take up that N preferentially, and nodulation will go way down, so they really don't 'fix' much N under those conditions. They become 'lazy' and take it from the soil solution, fertilizers, irrigation water, or manures or wasetwater. That's why alfalfa is such a great crop to 'scrub' N from soil water, since it's uptake level is so high (300-900 lbs N/acre per year). It's higher than corn, and because it's cut 5-9 times, one can apply every cutting. Alfalfa has been used to 'scrub' excess N from train fertilizer spillage, municipal wastes, and dairy wastes. It's deep roots assist in helping to draw these waters up from lower down. If the irrigation is adequate (and not over-irrigated), it can be used to mitigate excess N in water if necessary. So your friend Tom Lockhart is correct. I had no idea that one of the reasons alfalfa hay is good to have during a drought is that it can get water deep in the soil. I can see why this would be important to know if you have livestock that rely on this for food. My wife and I currently live in a desert area and are looking into getting a couple horses. I'll have to ask around to see if alfalfa would be a good choice to use. I am presently pursuing an MSc. in Water and Environmental Management and have been exasperated at the seemingly endless journal articles and studies that seek to expose negative impacts with respect to climate change while completely overlooking benefits. Your article is so refreshing and positive and accurate. I am delighted to read something from someone who is knowledgeable and not afraid to go against the present popular opinion. I wonder if you happen to have any information about the amount of CO2 alfalfa crops consume along with how much O2 the crops produce. I expect this will be yet another reason to encourage the continued growth of alfalfa. Thank you for posting your report. I'm not sure if I agree that my article was about the positive benefits of climate change. In fact climate change will provide major challenges for the future in addition to our increased demand for water and land. In terms of CO2, there is not a lot of data, but stable, leguminous forages like alfalfa often provide the soil stability for carbon capture in agricultural systems.